The guest room is officially done! The neighbor girl who plays with Dorothy walked in, not having been in the room since we were using it for post-move storage, and gasped. It was so gratifying. 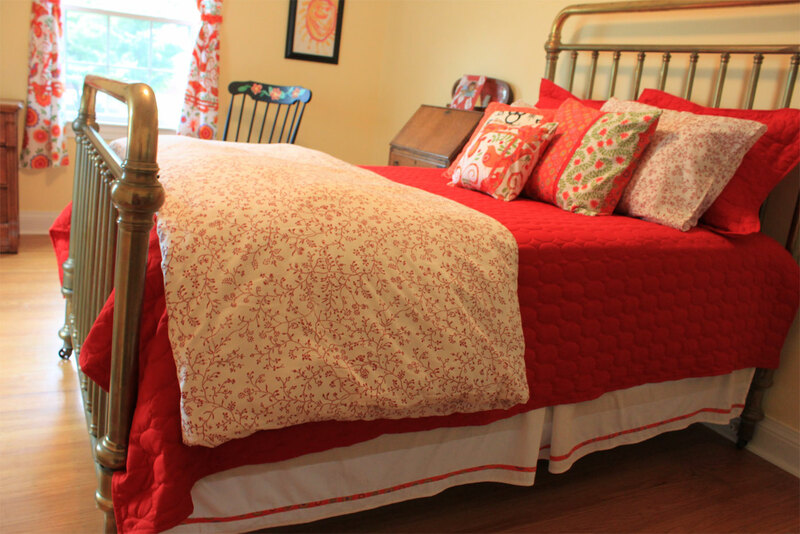 And then she was so impressed that we had a whole room just for guests that it made me remember Anne of Green Gables and Aunt Josephine and I secretly vowed to invite her over to sleep in it sometime. It does feel sort of indulgent to have a guest room after we seemed so cramped with the four of us in our two-bedroom six months ago. I made up the bed with clean sheets today and am feeling that much more settled here. Ignore that the brass bed really needs to be polished. 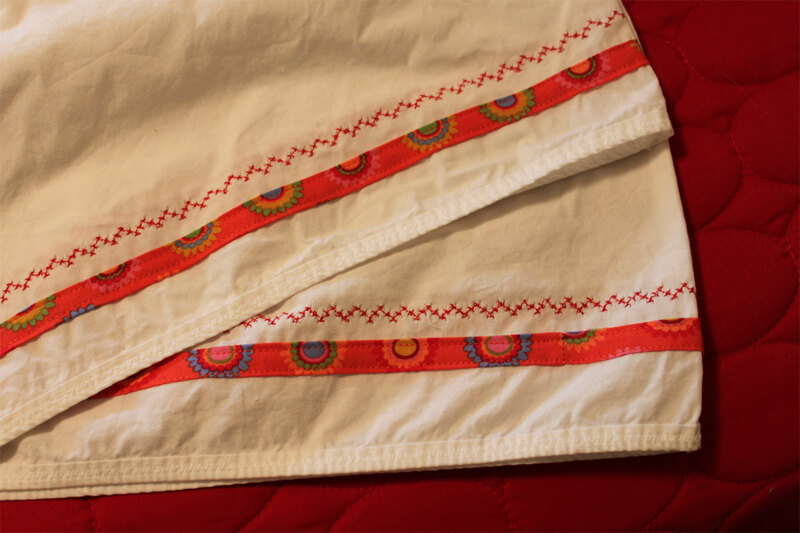 I augmented store-bought bedding (Target and IKEA) with homemade toss pillows and I sewed homemade bias tape along the bottom of a plain store-bought bed skirt. In such a bright room I wanted bright photographs too. 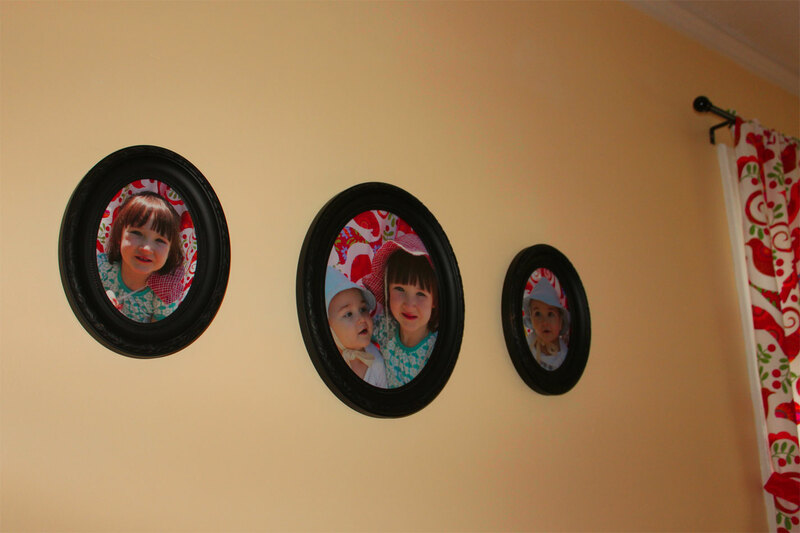 I painted old gold picture frames black, then snapped photos of the kids posing against a backdrop of the (uncut) curtain fabric. It’s not like you’d walk in and notice that the photo backdrop matches the curtains, which is just as well, but the overall effect does help tie everything together in this bright and colorful room. 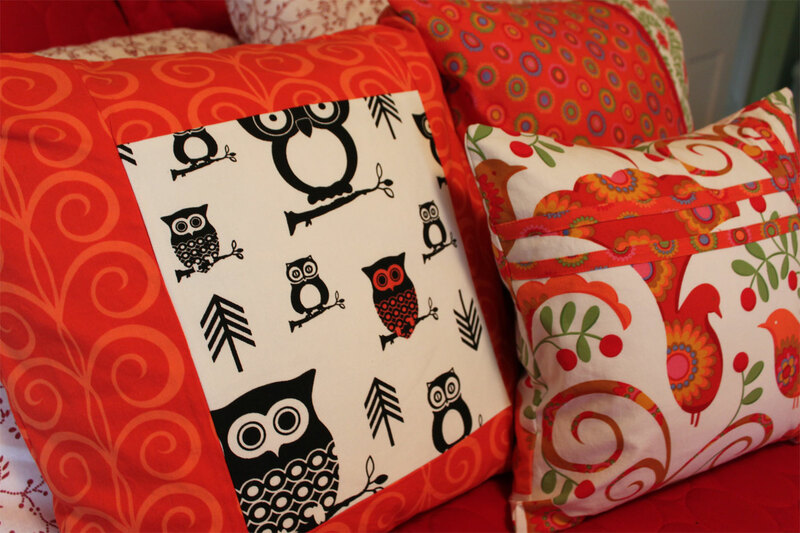 I wanted to bring some of the room’s black accents onto the bed so I made one pillow using this terrific owl fabric I found online. It didn’t quite work, though. You remember that Sesame Street game from when we were kids? Which of these things doesn’t belong? It was totally this pillow. I thought that if just one owl could be orange then it would really make everything look harmonious, so I grabbed an orange Sharpie marker and colored one owl in. Let’s hope the cat doesn’t puke on this pillow because I have no idea how orange Sharpie would wash, but I love the way it turned out. Now the pillow looks like it belongs perfectly. I also embellished the white pillowcases that go with the plain white sheets on this bed. I used more of the homemade bias tape (do I need a support group for my recent bias tape problem?) and some of the decorative stitching on my new machine. 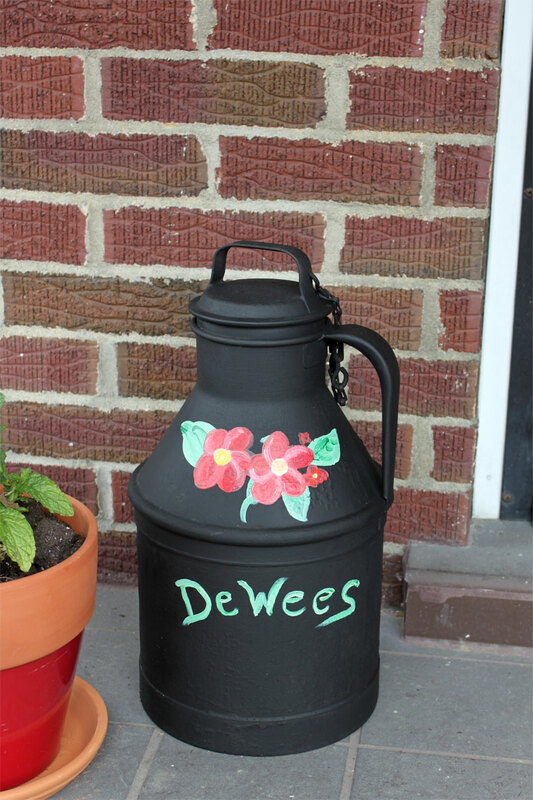 My success in painting the hokey flowers on the thrift store rocking chair inspired me to try something similar on an old milk can. I bought this jug at a yard sale when we lived in Oak Park and kept it on our front porch at our last two houses. It was already black but was starting to look sort of pathetic and rusty, so I sprayed on some new black and painted on the flowers and our name. I may get tired of looking at my own unprofessional art work every time I enter my front door, but it shouldn’t be hard to spray on over the decoration when that time comes.